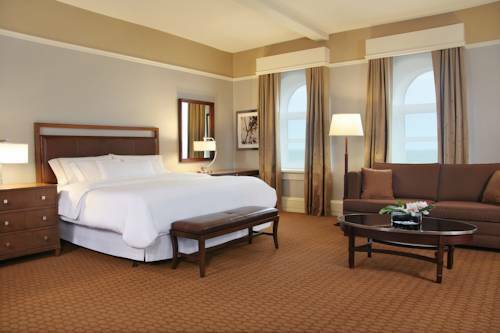 Join us for a rejuvenating stay at The Westin Great Southern Columbus. Situated near the German Village in a historic, beautifully renovated red brick building first opened in 1897, we offer a relaxing getaway in the heart of downtown. Our newly remodeled hotel offers a blend of timeless elegance, modern sophistication and wellness features created to help you eat, sleep, move, feel, work and play well. Collaborate or celebrate in our gorgeous Grand Ballroom, consistently acclaimed as the premiere event venue in Columbus. Hit your stride in the state-of-the-art WestinWORKOUT Fitness Studio. Our three distinctive restaurants fuel your days and enliven you evenings with signature SuperFoodsRx cuisine and vibrant ambiance. After a day of travel, meetings or exploring Columbus, you'll look forward to relaxing and recharging in our newly reimagined hotel rooms and suites featuring signature touches, including our Westin Heavenly Bath and sumptuous Westin Heavenly Bed. Great Southern Whiskey Bar: Let us show you the way to the next great whiskey bar. Sip a variety of whiskeys or savor signature cocktails in a chic setting perfect for catching up with friends or unwinding with colleagues. High Street Grill: Fuel up for your day in Columbus with a hot breakfast, stop by for a quick lunch or linger longer over dinner and cocktails at this welcoming restaurant featuring classic American favorites. Caf Express: Visit our lobby caf for coffee and grab-and-go items to take along as you explore Columbus. Choose hot breakfast favorites and pastries or salads and sandwiches made with the freshest ingredients, Starbucks coffee and a variety of drinks.